Three comics from September 2, 2015. This week’s theme is starting from scratch. We took two months off this summer, but we're back, and the show is back, and we have no idea if it’s going to be like riding a bike or like learning a new language. We picked three first issues just to hit the proverbial hammer even harder. 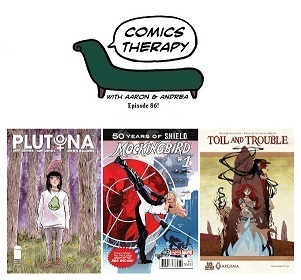 And because nothing reminds Andrea of old times more than arguing with Aaron over gender roles and representation in the media, all three titles feature a diverse lineup of strong, complicated, vulnerable, messy, passionate female characters. You know, like actual people.